Make your crafts as unique as you! 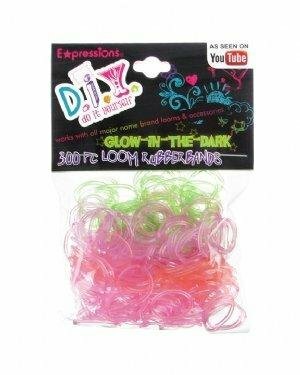 Add these super Glow in the Dark rubber bands to your Rubber Band Bracelet Loom Kit and have even more fun making bracelets for you and your friends! The Expressions D.I.Y. Rubber Band Refill Packs are compatible with all popular rubber band loom kits. The pack includes 300 latex-free rubber bands in assorted colors and 12 clasps.